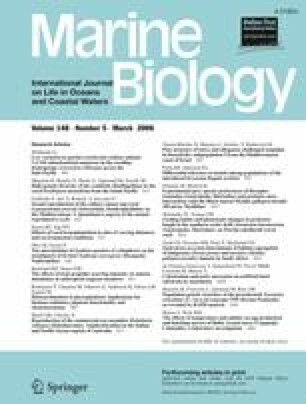 Surveys of genetic variation within cosmopolitan marine species often uncover deep divergences, indicating historical separation and potentially cryptic speciation. Based on broad geographic (coastal eastern North America, Gulf of Mexico, western Africa, Australia, and Hawaii) and temporal sampling (1991–2003), mitochondrial (control region [CR] and cytochrome oxidase I [COI]) and nuclear gene (lactate dehydrogenase A intron 6 [LDHA6]) variation among 76 individuals was used to test for cryptic speciation in the scalloped hammerhead, Sphyrna lewini (Griffith and Smith). CR and COI gene trees confirmed previous evidence of divergence between Atlantic and Indo-Pacific scalloped hammerhead populations; populations were reciprocally monophyletic. However, the between-basin divergence recorded in the mtDNA genome was not reflected in nuclear gene phylogenies; alleles for LDHA6 were shared between ocean basins, and Atlantic and Indo-Pacific populations were not reciprocally monophyletic. Unexpectedly, CR, COI, and LDHA6 gene trees recovered a deep phylogenetic partition within the Atlantic samples. For mtDNA haplotypes, which segregated by basin, average genetic distances were higher among Atlantic haplotypes (CR: DHKY=0.036, COI: DGTR=0.016) than among Indo-Pacific haplotypes (CR: DHKY=0.010, COI: DGTR=0.006) and approximated divergences between basins for CR (DHKY=0.036 within Atlantic; DHKY=0.042 between basins). Vertebral counts for eight specimens representing divergent lineages from the western north Atlantic were consistent with the genetic data. Coexistence of discrete lineages in the Atlantic, complete disequilibrium between nuclear and mitochondrial alleles within lineages and concordant partitions in genetic and morphological characters indicates reproductive isolation and thus the occurrence of a cryptic species of scalloped hammerhead in the western north Atlantic. Effective management of large coastal shark species should incorporate this important discovery and the inference from sampling that the cryptic scalloped hammerhead is less abundant than S. lewini, making it potentially more susceptible to fishery pressure. This study was made possible through the generous contribution of hammerhead shark samples by C. Woodley, National Ocean Service, Charleston, SC; M. Grace, L. Jones, National Marine Fisheries Service, Pascagoula, MS Laboratory; J. Carlson, Southeast Fisheries Science Center, National Marine Fisheries Service, Panama City, FL; G. Ulrich, D. Oakley, South Carolina Department of Natural Resources, Marine Resources Division, Charleston, SC; E. Heist, Southern Illinois University, Carbondale, IL; F. Rohde, North Carolina Division of Marine Fisheries; R. McAuley, Department of Fisheries, Government of Western Australia; M. Shivji, Nova University, and B. Stequert, Centre ORSTOM de Brest. T. Burgess, K. Oswald, and M. Roberts provided invaluable assistance with laboratory and analytical techniques. Funding for this project was provided by the Cooperative Institute for Fisheries Molecular Biology (FISHTEC; NOAA/NMFS (RT/F-1)), the National Science Foundation (OCE-9814172), and SC SeaGrant (R/MT-5) to JMQ. Additional funding was provided by the Louisiana Board of Regents Support Fund, LEQSF ((2000-2001)-ENH-TR-67) and the Graduate School, College of Sciences, and Department of Biological Sciences, University of New Orleans to JMG.